Please excuse this bit of shameless self-promotion, but Yonkers clown and performer Adam Gertsacov (Hey,that's me!) is directing a play at Fairfield University. He is also one of the top Dario Fo scholars in the world. Fairfield, CT, October 22, 2007 --(PR.com)-- We Won’t Pay! 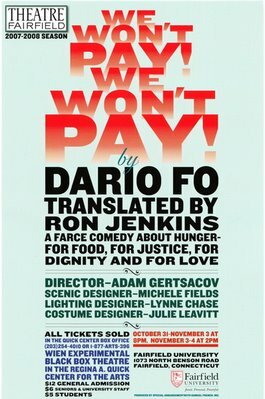 We Won’t Pay! is a social farce with a message. In the play, high prices have caused a revolution in the supermarket, with housewives stealing food from the market. When they get home, they realize they can't tell their husbands where they got the food, and pretend to be pregnant. From this one simple lie, a farce develops so that by the end of the play nearly everybody in the cast (including the policeman, who looks suspiciously like a number of other characters in the play) has become pregnant. Written in Italy in the early 1970’s, the play has sparked social actions. Soon after the play was first performed, a similar supermarket riot took place in Italy. The play was later performed on the site of a Fiat plant strike, and has become a much loved play among workers and political leftists. Since 1974, the play has been translated into over a dozen languages, and performed in more than 30 countries around the world. It is considered by many theatrical critics to be one of the great comedies of the twentieth century. 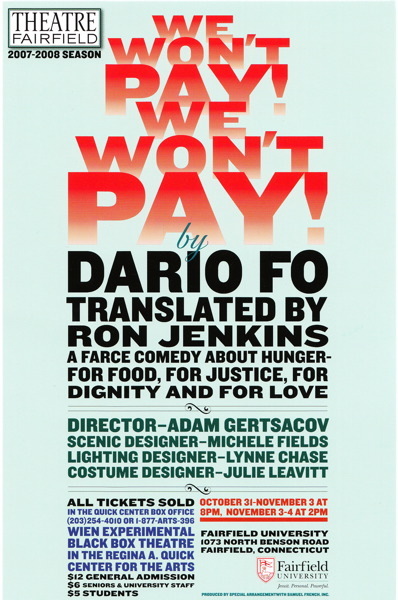 The author, Dario Fo, is an Italian satirist, playwright, actor, director, composer, and clown. In 1997 he was awarded the Nobel Prize for Literature. In 2006 he ran an unsuccessful race for mayor of Milan, and lost by a very tiny margin. He is the author of more than 20 plays, and currently runs a theatre company in Italy with his wife, celebrated Italian actress Franca Rame. The director, Adam Gertsacov, is a clown and performer based in Yonkers, New York. Adam is the current Clown Laureate of Greenbelt, Maryland. He has performed his original shows in over 39 states and 7 countries, as well as on Czech, Canadian, and American television and radio. Gertsacov is the artistic director and boss clown of the Acme Clown Company. In addition to his work as a performer, Gertsacov is the director and curator of Bright Night Providence, a New Year’s Eve Celebration in Providence, RI. Sunday November 4 @ 2 pm. Call 1-877-ARTS-396 or (203) 254-4010 to purchase tickets or for additional information. You may also visit http://fairfield.edu/x1534.html for more information. Comments on "The Play I'm directing.. 10/31- 11/4 in Fairfield CT"